Note – all links in this post open in a new browser window. It would be a good idea to clear your cache from time to time, to make sure your browser loads the latest version of this post. 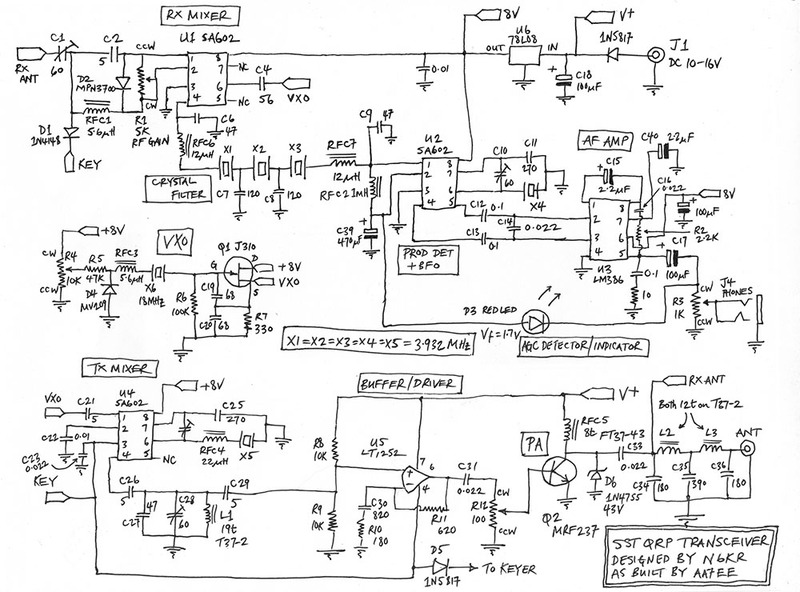 As an example, I just found an error on the schematic, and uploaded a newer, correct diagram. I’ve been wanting to build an SST for a few years now. It’s a plucky little rig, with a lot of character. Designed by Wayne N6KR in the late 90’s, appearing as a full article in QRPp, and a kit sold by Wilderness Radio, it ignited the imaginations of a whole generation of builders for it’s combination of simplicity, performance, and willingness to accept modifications cheerfully. The review from Adventure Radio Society was quite positive. 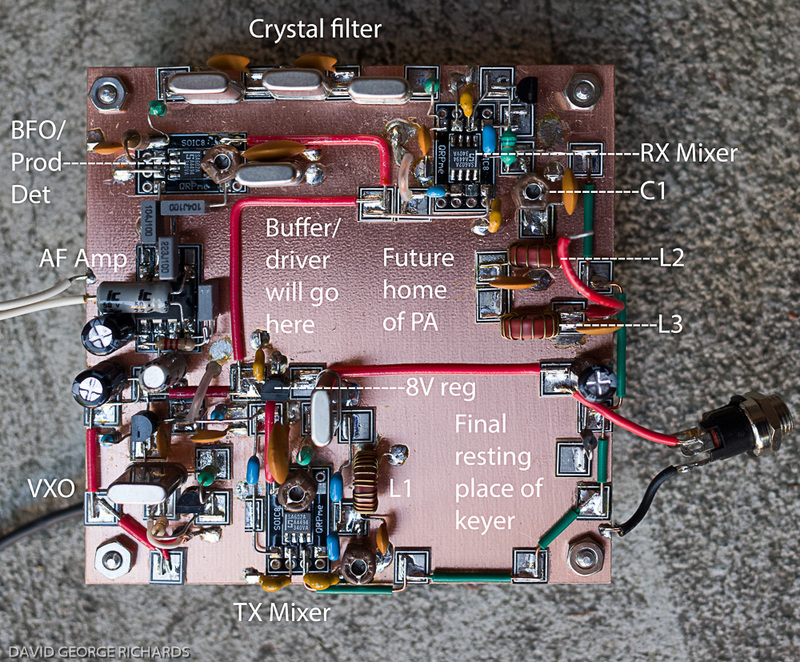 It is a VXO-based QRP CW transceiver, with a simple superhet receiver (SST = Simple Superhet Transceiver), and a TX that puts out up to 3W, depending on your choice of transistor in the final (it can be dialed down for battery-powered outings). It has very fast, clean QSK – so fast, in fact, that it feels as if I can hear the band all the time I’m sending (W6JL would approve). 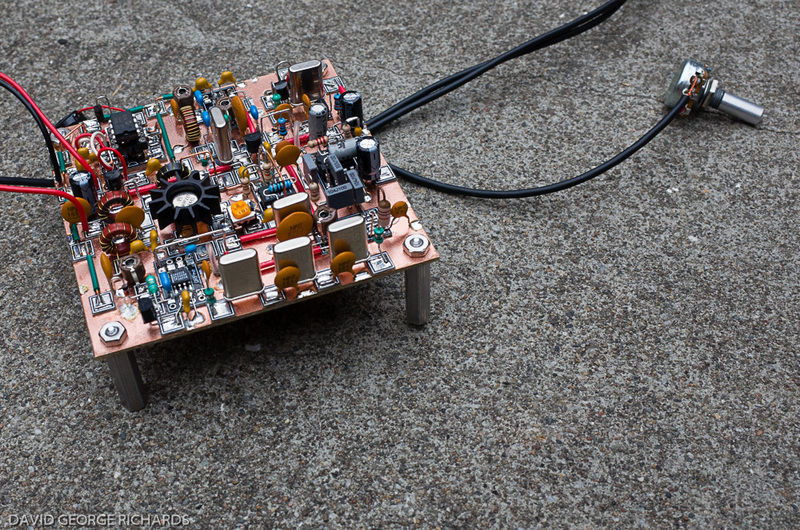 You actually listen to your own signal as you’re sending – there is no separately generated sidetone. The sidetone level does vary with the volume control, as opposed to being a fixed volume, but I only find this to be an issue when I have the AF gain all the way up, in which case I either quickly adjust the volume knob, or partially pull the earbuds away from my ears while sending. By the way, the sidetone on this little rig sounds really nice. It’s a feature which helps to make operating the SST an enjoyable experience. QRP’ers loved their SST’s. 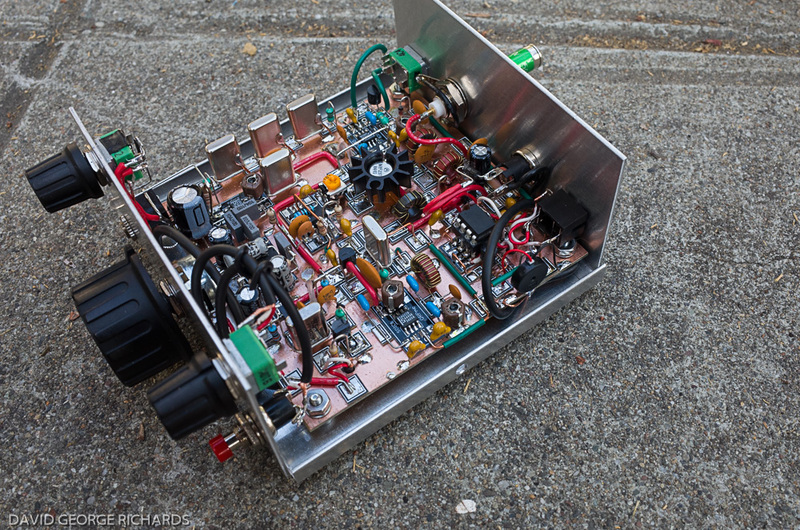 There was a lively discussion about the minimalist rig on QRP-L, with builders reporting back on the frequency coverage and performance of their builds, with details of mods they were trying. 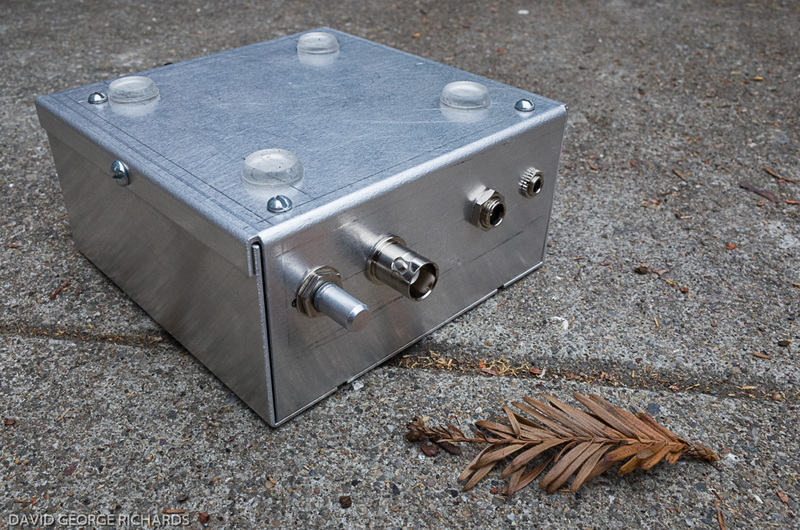 The kit came with a light gauge unfinished aluminum enclosure. The raw-finish aluminum was a blank slate which invited many different creative solutions to the age-old question of how to show off your project. Some folk endowed theirs with professional-looking paint jobs, while others used dymo labels, or simply scrawled right onto the panel with a Sharpie® for that authentic home-brew look. All approaches worked admirably well. I saw one SST that had been painted with a US flag, and looked great. Some of them were taken out on the trail many times, and showed many knocks and scratches on the case which, of course, just made ’em look better still. 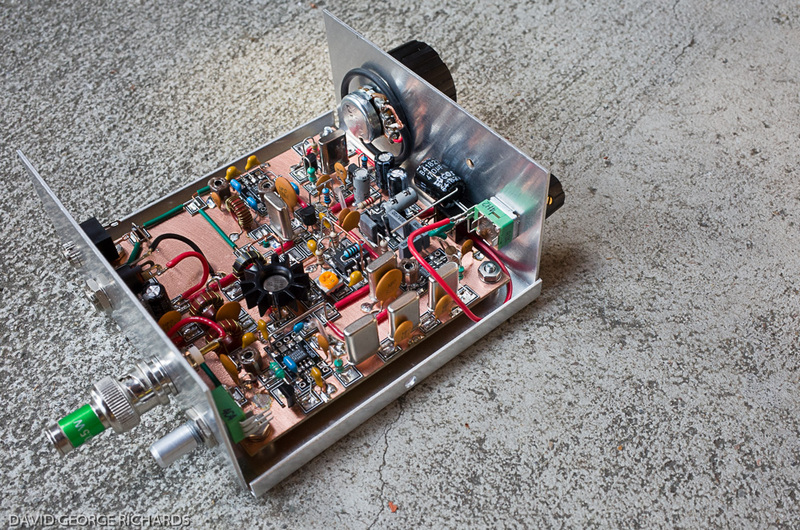 Koichi JN3DMJ modified his kit version of the SST40 with 2 varacters for extra frequency coverage. He also added a speaker, a spot button, and expanded the LPF for better filtering of the transmitted signal. Click on this photo to go to his site, and read more about his SST. He says that this SST is his favorite rig. He has made over 1300 QSO’s on it so far. Thank you for the permission to reproduce this photo and link to your site Koichi. 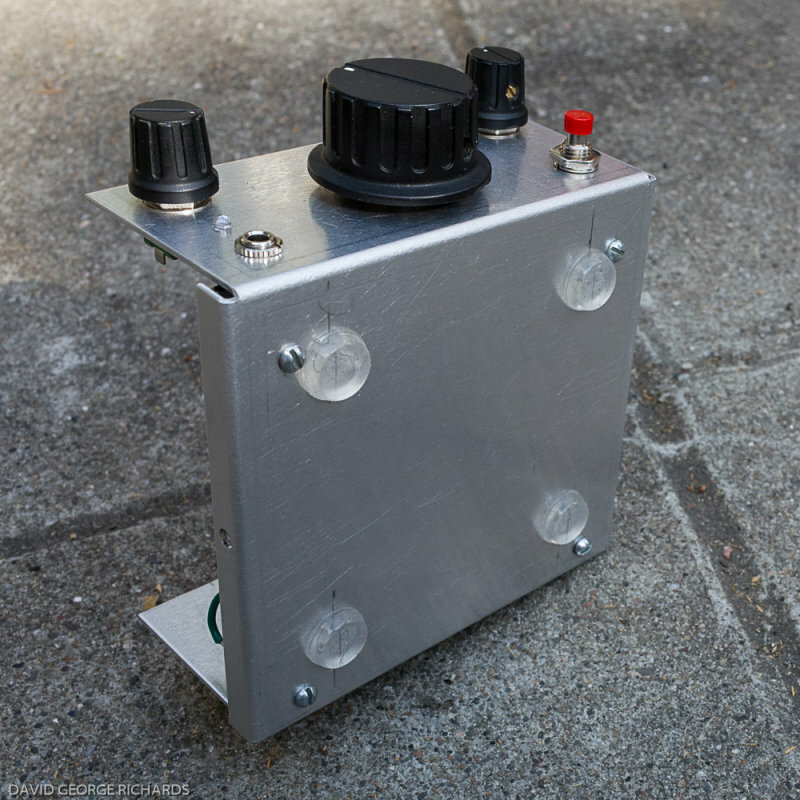 Recently, I decided it was time to build my own SST, only to find that I had missed the boat on a kit, as Wilderness Radio had discontinued it at some point in the recent past. I called QRP Bob on the phone, hoping that there would perhaps still be a board and/or enclosure available, but I was out of luck. In fact, it meant that I was in luck, as I would have to scratch-build one, and that’s a good thing. There is plenty of documentation for this rig online. The initial write-up was in the Spring 1997 edition of QRPp, available from Chuck K7QO here. Note that the preceding link is a PDF of all 4 volumes from that year. The entire QRPp archive is also on Chuck’s site and accessible from the main page. The link to the original manual for the SST kit that I quoted here is no longer working, so I have removed it. If you e-mail me, I can send you a copy of the manual – I’m good in QRZ. Other essential documentation is the mods and information collected from QRP-L messages from 1997-2004, from Ken Larsen AL7FS, here as an HTML file, here as a text file, or here as a .doc file. Note – I do not recommend using the LPF comprised by C34, C35, C36, L2 and L3. Although it just met FCC specs at the time of release, it is very unlikely to provide enough filtering for this rig to meet current FCC rules regarding suppression of spurious emissions. For more satisfactory filtering, see my post here. Component designations (e.g. C27, R11 etc) are the same as in the schematic in the Wilderness Radio manual. There are 3 parts in the above schematic that do not have such designations – they were added by me (the series capacitor and resistor from pin 5 of U3 to ground, and the 1N5817 diode in series with the 10-16V DC supply line). 1) Inclusion of a series diode in the supply line for polarity protection. I did consider using a P-channel MOSFET so as to avoid the voltage drop, but decided to go with a Schottky barrier diode. Some diodes of this type have a big enough reverse leakage current such that they are not effective in this role, but not so the 1N5817. It’s forward voltage drop is about 0.34V in transmit. I still don’t like losing that much, but it’s an improvement on the higher drop of a regular silicon diode. 3) The use of 68pF capacitors for C19 and C20 instead of the 100pF values specified. With 100pF feedback caps, my VXO wouldn’t oscillate, so I swapped them for 68pF ones, and it sprang into life (thanks to LA3PNA for the help on that). It may well also have oscillated with 82pF caps, and that is an option if you want your frequency coverage to be a little lower. 4) An MRF237 was used for the final instead of a 2N3553. This substitution was suggested in the manual for higher output power, as the MRF237 has higher gain. If you want a cheaper and more modern alternative to the 2N3553, I’m thinking that a BD139 should work as a direct replacement. Joel KB6QVI just told me that W8DIZ has the 2SC5706 at 10 for $4, and I’m wondering how it would work in this application. 5) A Zobel network was added to the output of the LM386. Mine was unstable at high volume settings. A series capacitor and resistor from pin 5 to ground is very commonly used in these circuits, and the inclusion of these 2 parts tamed my instability immediately. 6) Alternate values of the capacitors in the crystal filter were used to widen out the response. The original values were reported to be giving a particularly narrow bandwidth of around 200 – 300Hz at the -6dB points. I wanted something a bit wider. There were several suggestions in the QRP-L archived discussions. K7SZ tried widening his SST20 out with the help of these suggestions, but it still wasn’t wide enough for him. He suggested the use of 47pF for C6 and C9, and 120pF for C7 and C8, which is what I used. Thanks Rich. A few builders went further, and implemented the ABX (adjustable bandwidth crystal filter) mod that was used in the Wilderness Radio version of the NorCal Sierra. EDIT – K7SZ notes in his ARRL book “Low Power Communication” that his mod brought the center frequency of the filter down too low for him on his SST30, so he ended up going back to the stock values. I have found that using the values of C7/C8 = 120pF and C6/C9 = 47pF that Rich suggested on QRP-L for his SST20, I set the sidetone at 400Hz ( a new thing of mine – I’m experimenting with lower than normal sidetone pitch), and the center of the filter passband was still about 20Hz lower, which I guess is pretty close. If you like higher sidetones though, you may be better off with one of the 2 sets of stock values in the SST manual. SECOND EDIT – I plan to tighten the response of the filter, by using the alternate values quoted in the manual. After using the SST for a while, I think my version is a little wide. The keyer uses a piezo transducer to announce the responses to command inputs made via the CMD pushbutton and the paddle. It would be possible to feed this audio into the AF amp of the SST so that it can be heard in the earphones, but I elected to fit a small piezo transducer on the edge of the board. I had intended to punch a small hole in the side of the case to make it easy to hear, but this appeared not to be necessary. 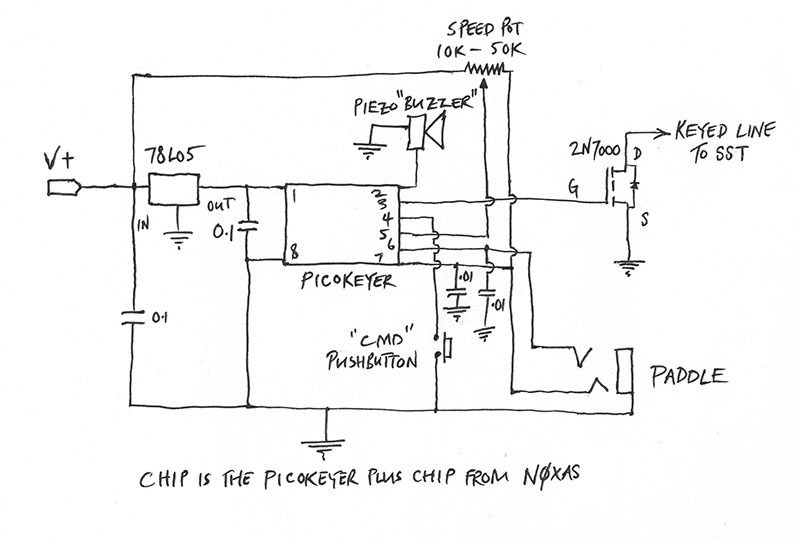 Note that in the schematic, I have called it a piezo “buzzer”. It is actually a transducer, but allow me to explain. There are piezo buzzers available to which you apply a voltage, and the unit rewards you with a loud piercing tone, generated by an internal oscillator. Some of the units available are called piezo buzzers, but they don’t contain the audio oscillator – just a transducer, which is often sharply resonant at a specific audio frequency, to enhance the volume of the emitted tone. I bought a 5-pack of so-called “piezo buzzers” on eBay. They looked too small to contain an internal oscillator and I was correct – they consisted of just the transducer, which was exactly what was needed. If you compare the above photo to later pictures, you’ll notice that I ended up changing the layout of the front panel controls. 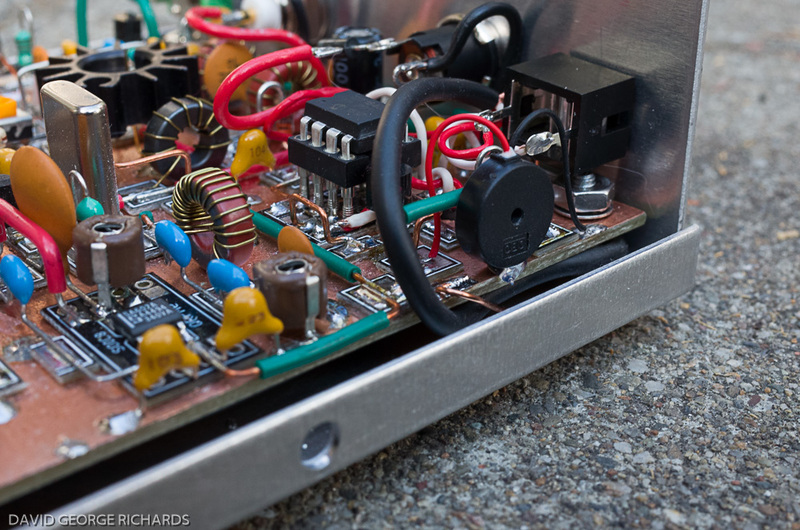 In the next picture, the AF amp and the VXO have been constructed, as well as the 8V regulated supply line. Temporary DC and headphone jacks were also connected, so the circuit can be plugged in to see if it works. The shielded cable that connects to the tuning pot was installed, but left longer than needed to allow for the final install in the enclosure. Not too much of the circuit had been built at this point, but it was already possible to test the voltages at the input and output of the regulator, as well as ensuring that the LM386 made a nice, loud noise when the input terminals were touched with a screwdriver (a highly controlled and accurate test 🙂 ) The VXO was tuned in on a nearby receiver and tested for frequency coverage. With the 20M version, the VXO is in the 18MHz range, and by subtracting the IF of 3.932MHz from the highest and lowest frequencies it oscillates at, you can estimate the final coverage of the SST, and make adjustments at this stage if you wish. 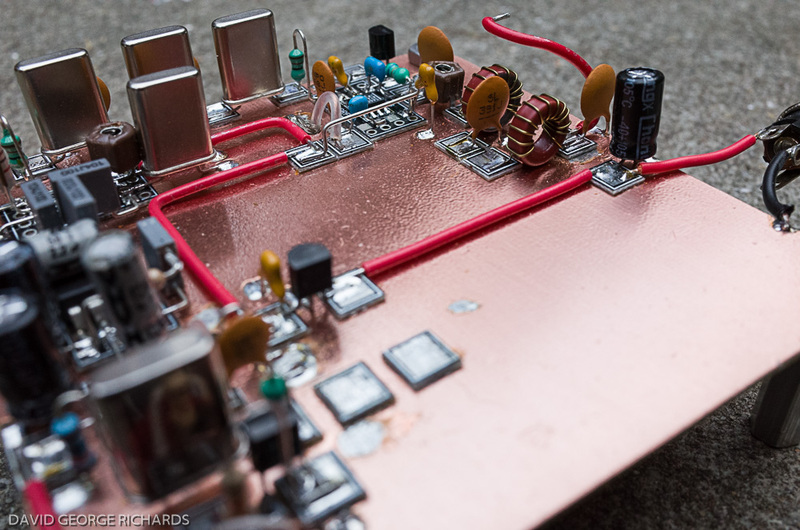 The discussions on QRP-L (which are linked earlier) contain a lot of info on tailoring the coverage, so I won’t repeat it all here, but your options involve using different varactors, connecting a second crystal in parallel with the VXO crystal, using different values of rubbering inductor, and adjusting the value of R5. I won’t explain how these all affect the frequency coverage and stability, as this is discussed at length in the QRP-L archive and also, to a certain extent, in the manual. 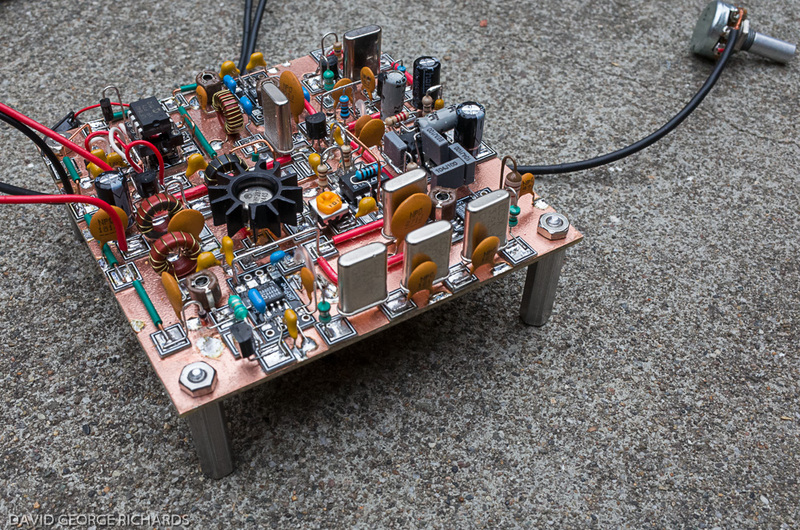 There is plenty of homework reading to be done if you are thinking of building this rig! As far as matching the 3 crystals for the filter, I placed them into an oscillator circuit, and measured the frequency of oscillation. My cheap Chinese stand-alone frequency counter only had a resolution of 100Hz, but then I remembered that my K2 had a built-in counter with a 10Hz resolution, so I used that. 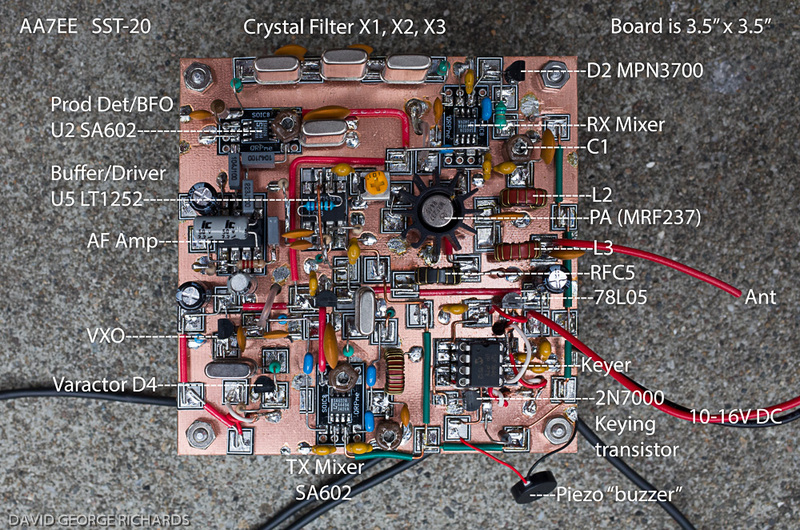 I needed 5 x 3.932MHz crystals total – 3 for the filter, and the other 2 for the oscillators in the TX mixer and the BFO/product detector, so I picked the 5 that were closest in frequency. Out of that group of 5, I took the 3 closest and used them for the filter, while the other 2 were used for the local oscillators (but not the VXO, which required an 18MHz crystal). To verify that the receiver is working, you’ll need to also build the antenna LPF, consisting of L1, L2, and associated parts. Without it, you won’t be able to peak the antenna input trimcap C1. Notice that if you touch the input of the crystal filter, the noise from the phones sounds much more restricted than when you touch the output of the filter. In fact, you can work your way back through the filter, with the rushing atmospheric noise becoming more and more restricted-sounding as you touch each stage of the filter with your metal screwdriver. These quick checks help to confirm that your project is pretty much on track. Adding the receive mixer means that the receiver is complete. 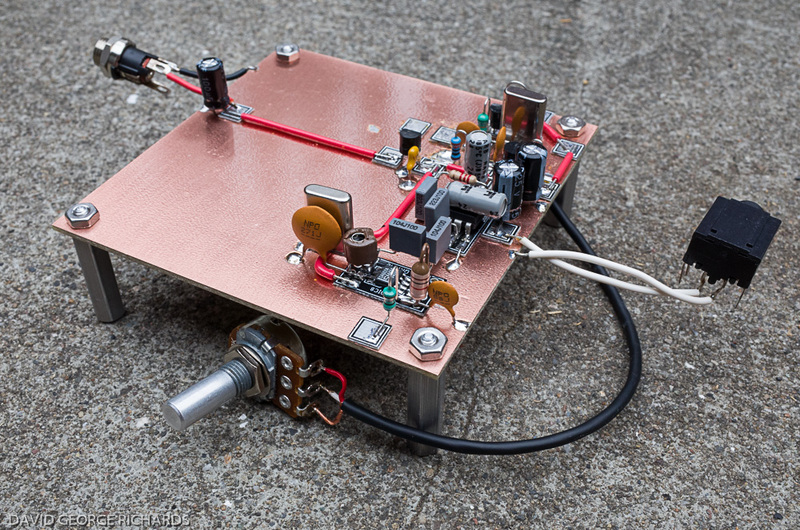 After peaking C1 for maximum band noise, you should be able to receive off-air signals. Congratulations! If you substituted a trimcap for C10, you can also adjust it to place the received signal in the center of the passband, an adjustment that will depend on what pitch of sidetone you like to listen to. My receiver didn’t work particularly well at first – I was getting very low audio out of it. One or two posts in the QRP-L archive made the same observation. 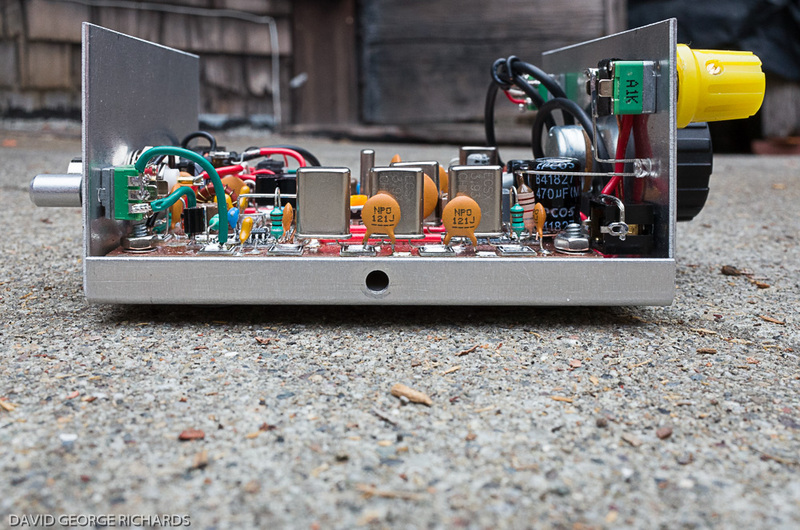 I was beginning to talk myself into believing that the design was deficient in the audio department, and resolving to substitute a different audio chain, when I discovered that the coax which delivered the output of the VXO to the input of the RX mixer wasn’t properly soldered at the output of the VXO, resulting in low drive to the RX mixer. Re-soldering the joint solved the problem, and I can happily report that the audio output is more than adequate to drive a quality set of earbuds or a pair of reasonably sensitive headphones. If you attempt to drive a speaker, you will find that the level is only adequate for monitoring whether a frequency has activity or not, in a quiet room. That’s fine, as this was designed as a trail-friendly rig, with low current consumption in mind, and it certainly achieves that. VK3HN mentioned to me the idea of adding a lower noise AF chain designed to drive a speaker, and retaining the original AF output stage, feeding the inputs of both in parallel. The advantage of this would be that you’d retain the AGC action provided by the LED. This is always the point, when building a transceiver, where I slow down and spend some time playing with the receiver. 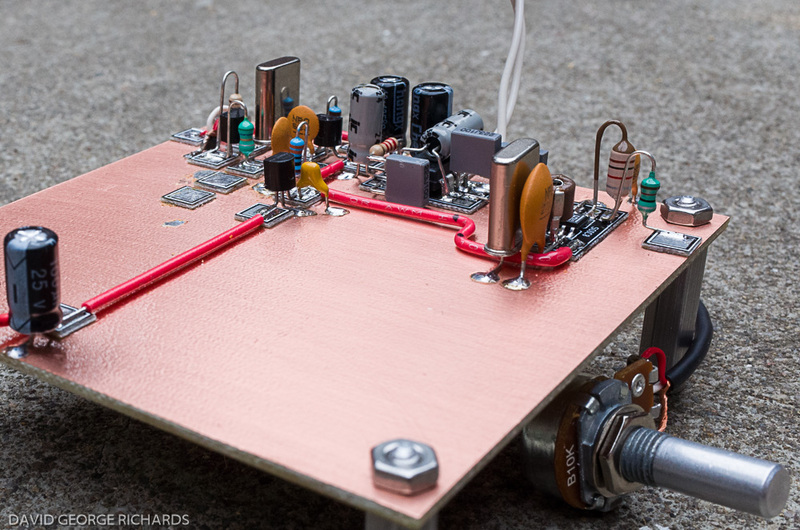 I was dead chuffed, as we Brits say, that I had successfully built a little superhet receiver with a narrow crystal filter, that was sensitive, and sounded good. This SST is quite a triumph for me, as it is the most complex project I have built so far with Rex’s MeSQUARES and MePADS. So how does it perform? Well, in 2 words – very well. I don’t operate a lot, but I do spend a lot of time listening. I’ve had 6 QSO’s so far with a horizontal loaded dipole (a Buddipole) at 25 feet above ground at my home QTH. 3 of them were with stations in Colorado, about 900 miles distant, one with KE5AKL who was doing a SOTA activation in NM, also 900 miles from me, and one with a mobile station in Hooks, Texas, who was running 25W. He was 1600 miles away as the crow flies. The other was with a local station. The receiver is as sensitive as you’d need a receiver to be, and there’s a good amount of opposite sideband suppression. I haven’t measured it, but you only hear the opposite side of the signal weakly when tuning through a very strong station. 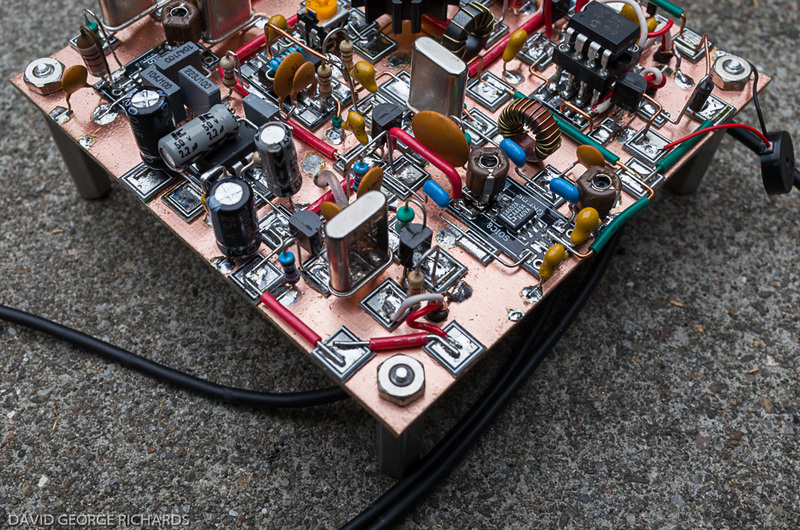 The RF gain only needs to be backed down when in the presence of very strong stations, as the use of an SA602 in the front end can cause it to crumble under such circumstances. I haven’t needed to use it yet, and from what I’ve read, it doesn’t need to be used very often – hence the reason it is on the back panel. My frequency coverage, with an MV209 varacter, is approximately 14055 – 14064KHz, a swing of 9KHz, which is about as much as you’d want when tuning with a 1-turn pot. 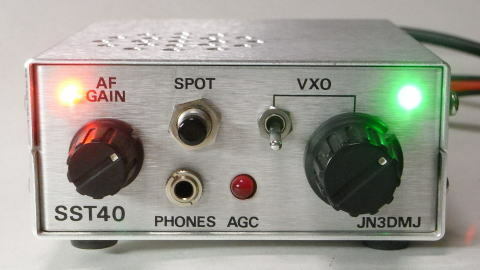 Many users mounted a switch on the front panel to switch in another varacter (usually an MVAM108, which was also supplied with the kit) to extend the coverage downwards. With the MRF237 in the final, my WM-2 wattmeter indicates an output power of about 2.25W with 11.61V at the input to the rig (11.27V after the polarity protection diode). When supplied with 13.8V from a PSU, the power output was about 2.8W. I didn’t measure the current consumption on transmit, but on receive it is between 26 and 27mA. This is low, but somewhat higher than the 15-16mA quoted in the manual. The keyer consumes <1mA, so that isn’t the reason for the difference. The AGC LED is a rather unique feature. 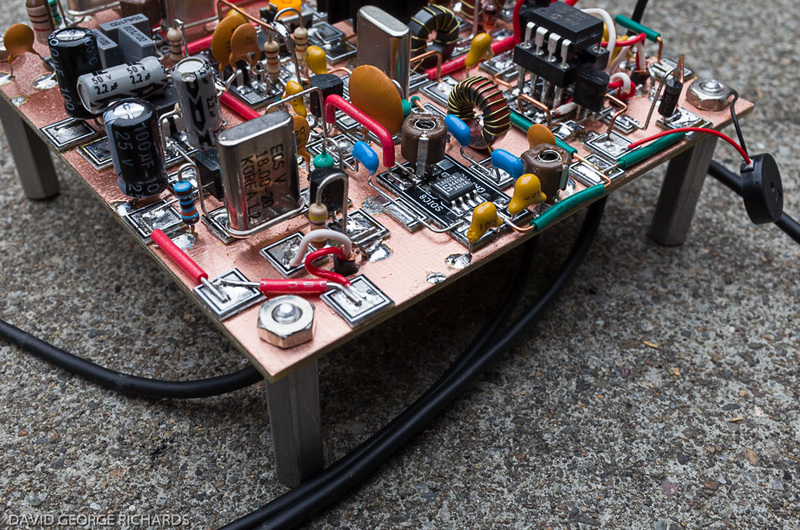 I’ll let you read up about it in the manual but for the addition of a few extra parts, it will save your ears from the worst ravages of sudden loud signals – and the LED is fun to watch too 🙂 Most red LED’s have a forward voltage drop of about 1.7 – 1.8V. If you want to raise the AGC threshold, look for a red LED with a higher Vf – some of them go as high as 2.2V. 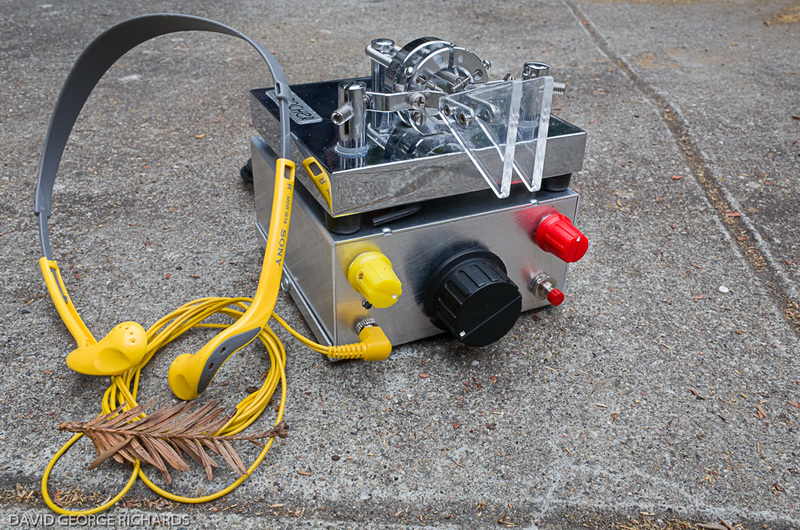 Although all the parts for this little rig are still available, a few of them are a bit harder to find than others. I purchased the LT1252 from Digi-Key – they have them in both through-hole and SMD versions. Chuck K7QO tipped me off to a supplier on eBay who was selling them in 10 packs. I couldn’t resist purchasing a pack. Thanks Chuck 🙂 W8DIZ has the MPN3700 PIN diodes, though see the next paragraph for a worthy substitute. There are several different choices for the PA transistor. 2N3553’s and MRF237’s were available on eBay when I was looking. Try to buy legitimate parts from a reputable supplier (my gut feelings seem to serve me well in this regard). I’m thinking that a BD139 would work in this position too. All the crystals are still available from Digi-Key. The part numbers are the same as in the SST manual, with the exception of X1-X5 for the 30M version. The manual quotes the Digi-Key part # as X007-ND. It is, in fact, CTX007-ND. Perhaps it changed. It has, after all, been 19 years since the kit was introduced! Even though this design is now quite old, I think it is still very relevant. 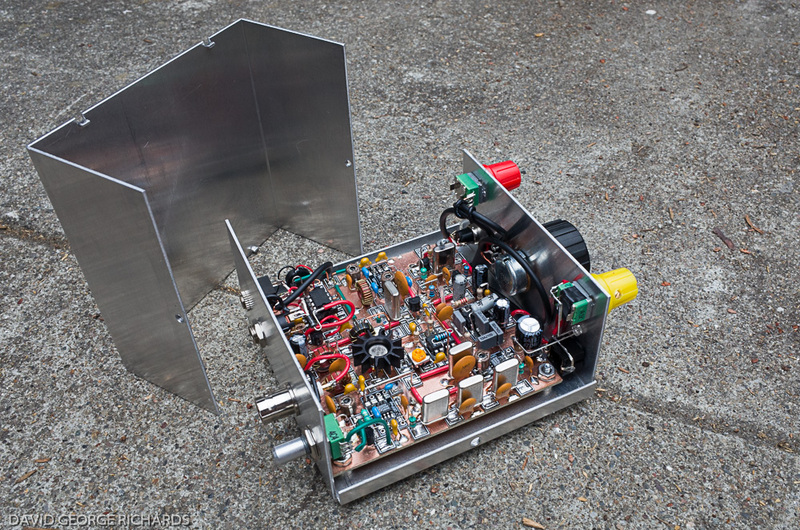 An experienced home-brewer can build this into a fairly small case, and take it on the trail with a simple tuner and, say, an EFHW, for a compact and effective portable set-up. All of the parts are still available, though it would be great to see a partial redesign, utilizing more modern and widely available parts. I’m thinking of a redesign of the buffer/driver and PA stages. 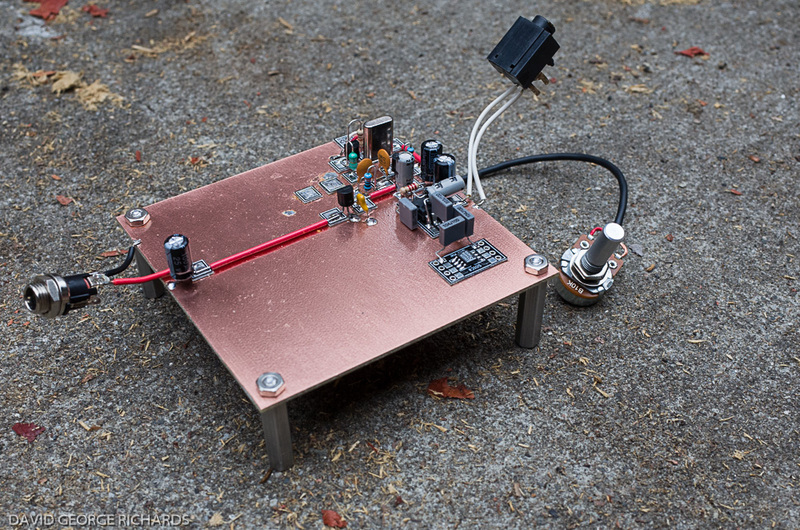 BS170’s are cheap, and 3 of them in parallel, in class E, could provide close to the full QRP gallon. The original SST had room in the case for a 9V lithium battery, and could be dialed down to lower output powers to help battery life. 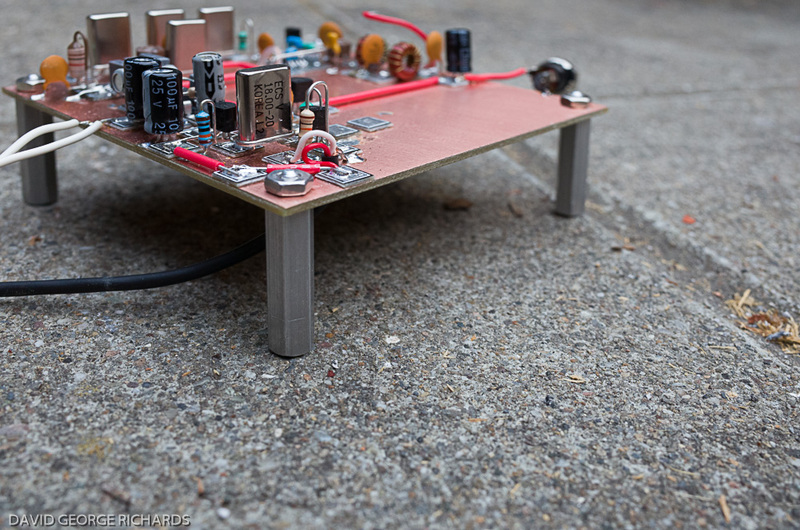 Nowadays, newer battery technologies make more power available in a light and small package, so running 4 or 5W while portable with a small rig like this is practical. Kenjia JH1PJL used an NPN transistor in his driver, instead of the LT1252 IC. 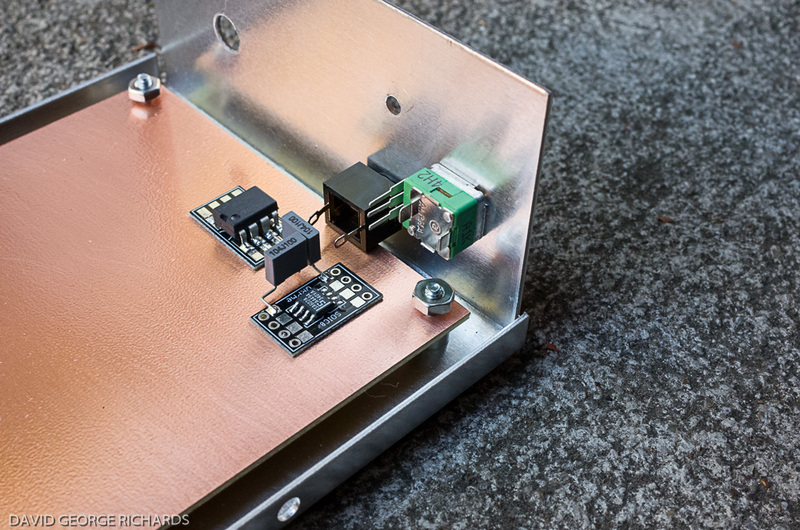 He also used a 1N4004 instead of the MPN3700 PIN diode (you can see pictures of his SST scratch-build here). In fact, all the diodes in the 1N4001 – 1N4007 series have the relatively slow recovery time of 30µS, giving them PIN characteristics. Any of them should work fine in place of the MPN3700. 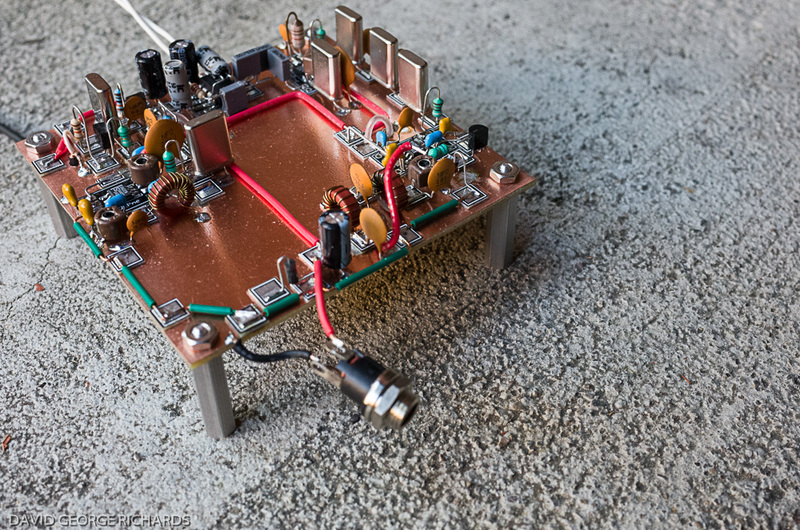 If a 1N4000-series diode is good enough for RF switching in the Elecraft K2 (the 1N4007), then it’s good enough for us! Both the above were done here. I have an actual SST20, with several mods. If you’d like more VXO range, try adding a small value NP0 or C0G from the crystal-RFC junction to ground. Mine has a 3 pF and I get about 14042-14064. However, the VXO voltage to the two mixers (RX, TX) drops by about 1/4 to 1/3 over the lower 2-3 kHz. 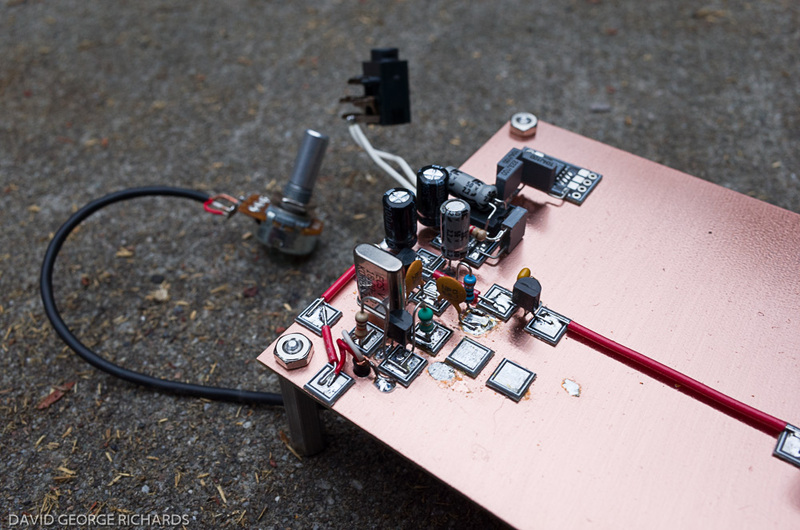 Also, I have a 1u8 RFC in series with the 5u6 below the crystal. Currently, it has the K8IQY filter mod, but I’m likely to change that per my crystal measurements and modelling (via W7ZOI’s GPLA). I’ve worked quite a bit of DX on mine over the years. When I lived in a condo (before 2000), the antenna was a `98 foot horizontal loop in the attic above the fourth floor and I regularly worked into EU from here in MD. Hope you like yours; it’s a neat little rig. A couple other simple mods: Add a 0.033 or 0.039uF between the product detector pins 4 and 5; this reduces some of the high frequency noise. Also, a 10 or 15 uF from the phone jack + to ground will reduce the noise a bit more (22uF is too much – its starts attenuating the desired signal). The latter is a RC low pass filter for audio; the R is the AF gain control. Thanks for the helpful tips Walt! Posted in Amateur Radio, Ham Radio, homebrew radio, QRP.Tagged AL7FS, K7SZ, MePADS, MeSQUARES, N0XAS, N6KR, QRPMe Manhattan pads, QRPMe MePADs, QRPMe MeSQUAREs, Simple Superhet Transceiver, SST, SST transceiver, WA4MNT, Wayne Burdick, Wilderness Radio SST. Yes, the SST is one fine radio. Mine is for 30 meters. BTW I love your work. You are an architectural artist. Thank you Bob. I was hoping it would work as well as it does. I think N6KR hit the sweet spot of design simplicity and performance with this rig. Love your King Charles Spaniel. They are intelligent and loving creatures! Great Job Dave, you really packed it in there. Looks good. Jingles cameo performance was great also. Your creations always look super slick! Don’t know how you do it, but I love reading about it! Thank you Steve. Like anything, it’s a process. No magic or black art to it! Thanks Randy. Yes – Jingles has me wrapped around her paw. I’d do almost anything for these 3 furry gals who live with me! As usual, your rigs are artistic in their construction and layout – yet very functional! For reverse power protection I have used the self-resetting (PTC) thermal fuses for many years now with a reverse-biased diode on the input supply rail (just “past” the fuse) to “blow” it if the power is connected backwards or the project develop a short circuit such as might happen if the PA transistor were to short out: After the error has been corrected the device rapidly cools and returns to its normal, low resistance – as if nothing had ever happened. These things are cheap and cause negligible voltage drop and have saved several pieces of my gear over the years, particularly when one is attempting a kludge from an unfamiliar power source and a voltmeter wasn’t handy. I particularly find them handy to be placed in miscellaneous power cables that are connected to a high-current source (a battery) that could possibly be shorted by accident – particularly when those coaxial power connectors with the exposed center connector that seems to be magnetically attracted to ground must be used! In some cases – where appropriate – I’ve replaced the original “one time” fuse in a piece of ham gear, sometimes by simply soldering the device onto the old, blown glass fuse and putting it back in the holder, selecting the appropriate device for the expected operating current. Of course, these devices aren’t much good for higher voltages (e.g. mains or anything above 30-60 volts, depending on its specs) but that doesn’t matter so much for portable gear. I don’t know why I didn’t think of that Clint – thank you for that excellent suggestion. I recognized your callsign immediately, because when I first got an FT-817, back in the early 2000’s, I spent many, many hours perusing your FT-817 pages. Putting all that information out there is a great service to the QRP community. Thank you! I still miss that little rig from time to time. Hi Dave, I tried to send you emails but they keep getting bounced back for some reason, but as always, I am very impressed and inspired with your works. I enjoy your schematics also, and am getting quite a library of them. Keep up the great work and I hope to get in touch with you soon via email. I just sent you an e-mail John. I have the same e-mail address as before, so that’s a bit odd. Let me know if you receive it. Great to hear from you! PS – often, after publishing a post, I will find small omissions in the schematics and correct them. If you’re collecting my haphazardly off-kilter schematics, I’d recommend re-downloading them every now and again, just to make sure. Stumbled upon your YouTube video and saw that the AA7EE Radio Works was back in biz pumping out these flawless beauties once more! Absolutely breathtaking work snd stunning write-up! Even appreciate thd touch of Fall with the pine needle snippets! The pine needles were already there, so I figured it was just as easy to use them in a photo, than clear them away! Thanks for the kind words, and good to hear from you again Bill. This is a superb SST, beautifully built, and not easily done considering the density of components. I am working on my receiver to modify it to become a direct conversion one. Am away from home right now. I have not used the Freq-Mite, so don’t know how it accounts for the IF. Will do a bit of reading and get back to you later Robert. Robert – what band is your SST for? If it’s for the general portion of 40M, then the IF is indeed 4MHz. If that’s the case, then you don’t need to enter an offset on the Freq-Mite – the Freq-mite is not concerned with the MHz digits. If your SST is for any other band, you’ll need to enter an offset equivalent to the numbers after the decimal point e.g. for the novice 40M SST, where the IF is 3.932, you enter 932 as the offset. If it’s a 30M SST, with a 4.194MHz IF, you enter 194 as the offset. Remember that whatever band your SST is on, you should program the Freq-Mite for inverted operation – because as the VXO frequency increases, the frequency of operation decreases. Thanks a lot , Dave. That will do it. Very nice. I’m feeling that I may have to make one. Many thanks for publishing what you have. In summer, I’m going to build a SST for 40 m. Could you please send me a copy of the original manual mentioned? It would be very nice. I sent it Aaron – please let me know when you’ve received it – or tell me if you haven’t. Good luck with your build! Gorgeous construction, Dave. My Norcal SST also uses switched MV varactor diodes but if you want much better dial coverage, simply parallel identical crystals, a process known as “crystal bending.” Both my SST-40 and SST-20 use this technique and I’m able to cover a large portion of the CW band with no detectable drift. My SSTs both use internal TiCK keyers, having built mine back in the late ’90s before more sophisticated keyer kits became available. Since the TiCK’s Vcc is rated between three and five volts, and the SST’s regulated voltage is +8V, some form of voltage drop was required. While it was possible to use the TiCK’s 78L05 regulator from the +12V supply, I chose to use two red LEDs in series between the SST’s eight volt supply and the TiCK. The LEDs flash in unison with CW and drop voltage within the TiCK’s Vcc ratings. BTW, using a 75L05 from the 8V source would have been marginal, even for a low drop-out regulator. As field battery time wears down, the input to the 78L05 would have fallen below spec. You could have tried a 3.3V regulator, but perhaps that was a little too close to the bottom end of the acceptable voltage range? There is also the very important deciding factor of which parts are to hand. I like your idea of using LED’s. Flashing things is always a bonus! I’ll bear in mind the idea of using parallel crystals if I do any similar builds in the future. Thanks for the input Paul! A superb project, very neat construction, wish I could do the same! Thank you Colin. I was pleasantly surprised myself actually, as it was the most dense component layout I have put together with this construction style. It took a while to get to this point. I’ve been building since I was about 8 or 9, and only tried Manhattan a few years ago. My first attempts were messy, though they did work. Practice makes perfect, I suppose, though I have to be very inspired to want to attempt something like this. There are only a certain number of designs which capture my imagination sufficiently to embark on a building spree. Thanks Neil. I was particularly proud of this project, as it has the highest component density I have achieved so far using this construction technique. Also, I managed it without too many “smell of burning plastic” moments! Good to hear from another SST fan – it’s a classic design.